What Does It Do? Creatine is an amino acid that helps supply muscles, including the heart, with energy, particularly for short-term, maximal exercise (See What It Is). Some, but not all studies suggest creatine supplements can improve muscle strength and endurance during repeated high-intensity exercise of short duration, such as weight lifting and sprinting, but is not helpful in purely aerobic exercise. Creatine may also be useful in improving exercise tolerance in patients with congestive heart failure (CHF) and muscle strength in people with muscular dystrophies (See What It Does). Is It Safe? Creatine is generally considered safe when taken in appropriate amounts for short periods of time, but little is known about potential long-term adverse effects of creatine. There is some concern that long-term use at high doses (20 grams/day) may adversely affect the kidneys and cardiovascular system (See Concerns and Cautions). How to Take? Commonly, a "loading" dose of creatine is taken for 5 to 14 days, followed by a maintenance dose. However, some studies have shown a benefit using a constant dose rather than a larger loading dose. If using a powder or mix, drink it as soon as possible -- creatine will begin to break down once in liquid. Also, when using creatine supplements, it is important to drink about 8 cups of water per day. For dosage details, see ConsumerTips for Buying and Using). What Do They Do? Branched chain amino acids are the essential amino acids isoleucine, leucine and valine that the body cannot produce (see What It Is). Taking BCAAs before and after exercise may help reduce or delay the onset of muscle soreness and improve muscle recovery. Leucine appears to be the most significant BCAA for stimulating protein synthesis (see What It Does). Are They Safe? 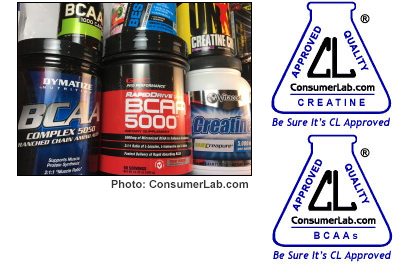 BCAAs are considered safe at standard doses, but may interact with certain medications (See Concerns and Cautions). How to Take? For muscle recovery and to prevent soreness, daily doses of 1 to 5 grams have been used. How to take this and doses for other uses are explained in ConsumerTips When Buying and Using. Learn about glutamine, HMB, and taurine. Also see information about the muscle enhancing effects of vitamin D, protein powders, and "nitric oxide" supplements. Creatine is a nitrogen-containing amino acid that is naturally produced in the human body from other amino acids, primarily in the kidneys and liver. Most (95%) of your body's creatine is found in muscle tissue, though it is also found in the heart, brain and other tissues. Creatine helps supply muscles with energy, particularly for short-term, maximal exercise. Food sources of creatine include meat, poultry, and fish. Branched-chain amino acids (BCAAs) are a group of three essential amino acids isoleucine, leucine and valine that the body cannot produce and needs to get from dietary sources. They are called "branched-chain" because their structure has a "branch" off the main trunk of the molecule. They take part in several metabolic processes in the body, are precursors in the synthesis of alanine and glutamine, and make up approximately one-third of skeletal muscle. During aerobic exercise of long duration (such as long-distance running, cycling, or swimming), the body may break down muscle in order to release BCAAs to be used as energy. Supplementing with BCAAs during or after a workout is believed to prevent muscle breakdown. Dietary sources of BCAAs include dairy protein, eggs, meat, chicken, fish and legumes. Muscle & Workout Supplements Review (Creatine and Branched-chain Amino Acids) !